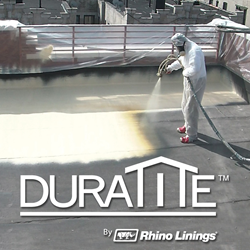 Rhino Linings Corporation, a global leader in the manufacturing and distribution of spray-on protective linings, coatings and foam, today announced the release of a complete cool roof system engineered to improve building energy efficiency while extending the service life of new and existing roofs. Rhino Linings Corporation, established in 1988 and headquartered in San Diego, California, is a privately-held corporation and world leader in protective coatings and linings. Products manufactured and distributed by Rhino Linings include polyurethane, polyaspartic and epoxy coatings, as well as concrete resurfacing and refinishing products, spray foam insulation and stucco. Rhino Linings Corporation has a global retail and industrial applicator network consisting of more than 2,000 independently owned and operated businesses in almost 80 countries. For more information about Rhino Linings, or to purchase Rhino Linings products, call 858-450-0441, or visit http://www.rhinolinings.com.